Interesting. I have been having a sour taste in my mouth for the last week or so. Kinda like when something is stuck between the teeth. I brushed and flossed to no avail. After using your Colloidal Silver once, the taste is gone. I'll see how it is in the morning. But, impressive so far! 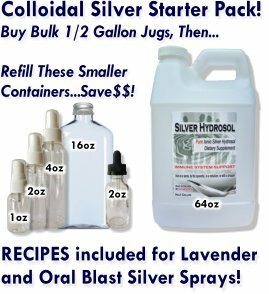 Comments for Your colloidal silver got rid of sour taste in my mouth! One of my favorite uses of colloidal silver is to mix it with a few drops of peppermint essential oil. Let's say I have a 2oz fine mist spray bottle (we sell them on our site). I will fill it up with colloidal silver hydrosol then add 15 drops of a high quality peppermint essential oil. After screwing on the sprayer to the bottle, I then tap the spray bottle on a hard surface like a countertop several times until the liquid is opaque. What's happening is that ultrasonic sound waves from tapping on the hard surface break up the oil so fine that for the most part the oil stays mixed with the water. And you can add some stevia to sweetened it up. Also, stevia has a little alcohol that helps keep the oil and water mixed too!